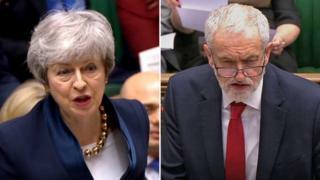 Talks between Theresa May and Jeremy Corbyn to break the Brexit deadlock have been called "constructive".The two leaders met on Wednesday afternoon and agreed a "programme of work" to try to find a way forward to put to MPs for a vote. It is understood that each party has appointed a negotiating team, which will meet later tonight ahead of a full day of discussions on Thursday. A spokesman for No 10 said both sides were "showing flexibility". And he added that the two parties gave "a commitment to bring the current Brexit uncertainty to a close". Speaking after the meeting, Mr Corbyn said there had not been "as much change as [he] had expected" in the PM's position.He said the meeting was "useful, but inconclusive", and talks would continue. The UK has until 12 April to propose a plan to the EU - which must be accepted by the bloc - or it will leave without a deal on that date. The PM proposed the talks in a statement on Tuesday night and wants to agree a way forward with the Labour leader for the Commons to vote on before 10 April - when the EU will hold an emergency summit on Brexit. If there is no agreement between the two leaders, Mrs May said a number of options would be put to MPs "to determine which course to pursue". In either event, Mrs May said she would ask the EU for a further short extension to hopefully get an agreement passed by Parliament before 22 May, so the UK does not have to take part in European elections. require(['https://news.files.bbci.co.uk/include/newsspec/19077-brexit-glossary/assets/embed/js/embed-init.jsThe SNP leader, who backs a further referendum and wants to remain in the EU, told reporters: "My concern is that in the rush to reach some compromise with the clock ticking, what will happen over the next few days... is a bad compromise will be reached. "The SNP, Liberal Democrats, Green Party, Plaid Cymru and the Independent Group have also held a joint press conference, calling for any decision made by the leaders to be put to a public vote. But some Tory Brexiteers have condemned the talks, with two ministers resigning over the issue. Chris Heaton-Harris quit on Wednesday afternoon, claiming his job at the Department for Exiting the European Union had become "irrelevant" if the government is not prepared to leave without a deal.Wales Minister Nigel Adams also resigned earlier, saying the government was at risk of failing to deliver "the Brexit people voted for".